6sqft’s series “Where I Work” takes us into the studios, offices, and businesses of New Yorkers across the city. 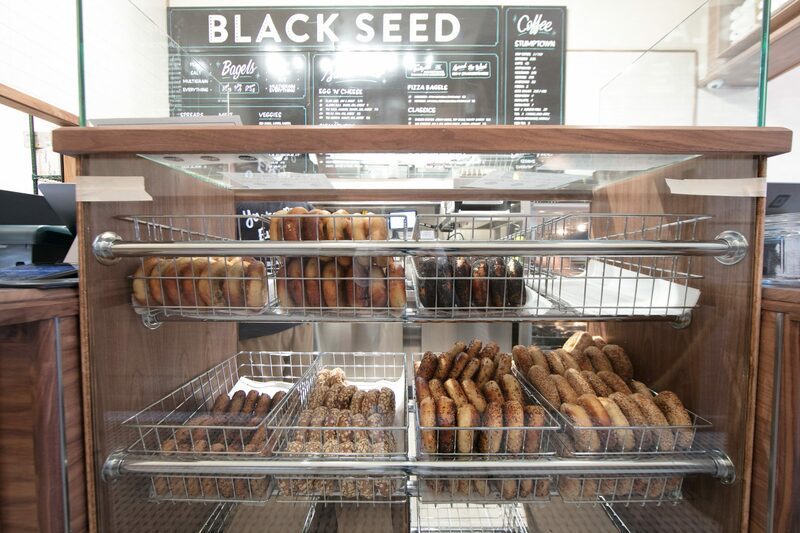 In this installment, we’re going inside Black Seed Bagels‘ new Nomad location. 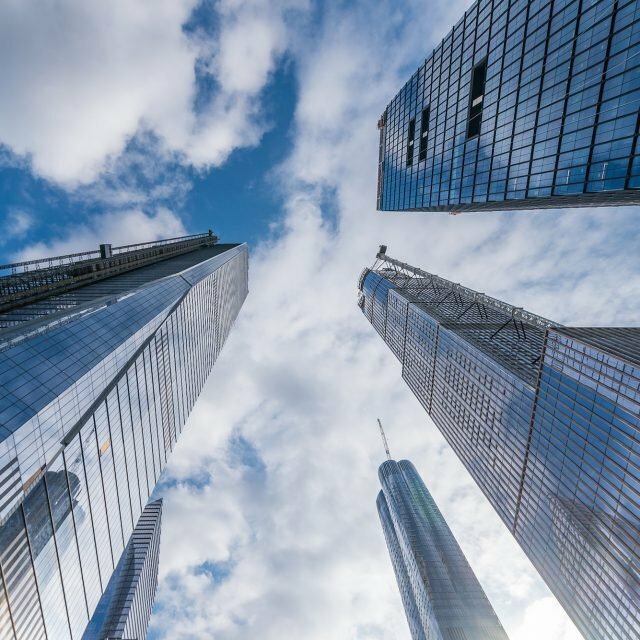 Want to see your business featured here? Get in touch! 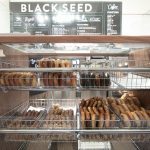 “We founded Black Seed with the goal of bringing extremely well-made bagels, bagel sandwiches, and coffee to everyone,” said co-owner Noah Bernamoff. 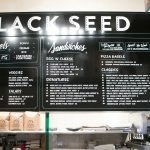 After he and Matt Kliegman met through a mutual friend while running separate restaurants (Matt, The Smile and the Jane Hotel ballroom and Noah, Mile End Delicatessen), they decided to open their first location of Black Seed Bagels in Nolita in 2014. 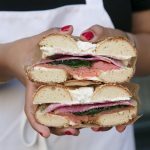 The Montreal-meets-New York-style bagels became an instant foodie hit, and the partners now have locations in the East Village, Battery Park City, and, as of this week, Nomad. 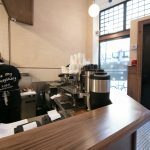 6sqft paid Noah a visit at their latest location in the trendy Ace Hotel and chatted with him about Black Seed’s journey. 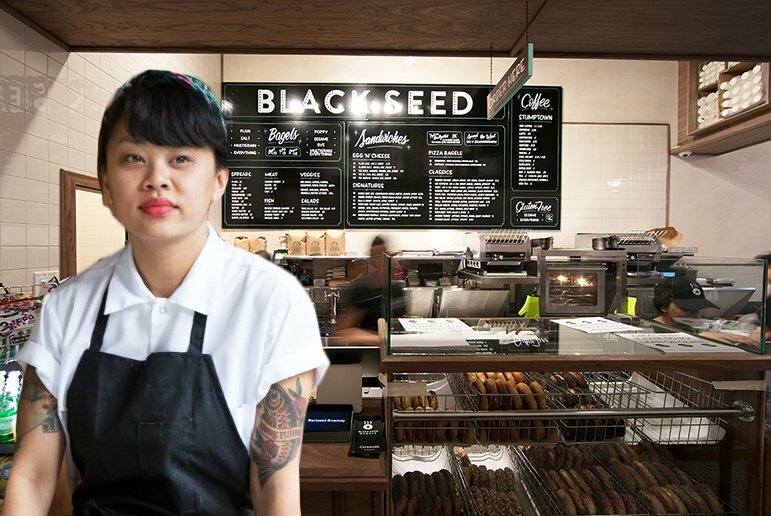 We also met with head baker Dianna Daoheung, who developed the shop’s unique hand-rolled, wood-fired bagels (which garnered her a James Beard nomination) and expanded the menu to include sandwich collaborations with fellow NYC restaurants and chefs. Each batch of bagels is baked in a wood-fired oven “just long enough to achieve perfection in crispness, density, and deliciousness.” When they’re lightly browned, they’re removed and tossed into a marble chute for cooling using hand-carved walnut peels. Let’s start with the difference between Montreal- and NYC-style bagels. Noah: I’m from Montreal and Matt is from Long Island, and we’re both proud of our respective bagel traditions. 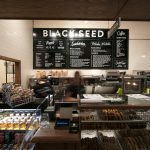 Black Seed draws inspiration from both traditions and strives to highlight the most delicious characteristics of each. 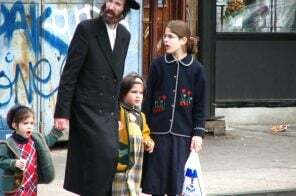 In Montreal, bagel shops only sell bagels and a few basic grocery items that typically accompany bagels, (i.e. packages of cream cheese and smoked fish), and they largely feel like bakeries. 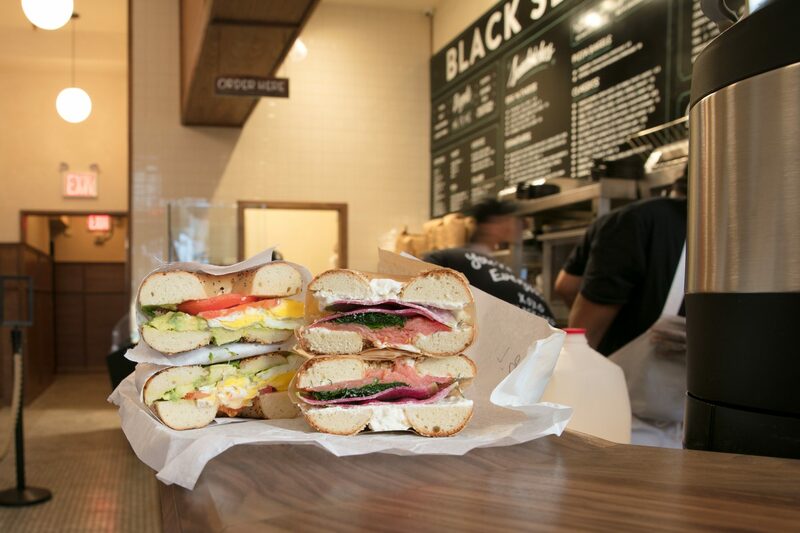 In NYC, bagels are available on nearly every corner and are served as sandwiches in nearly every way imaginable. 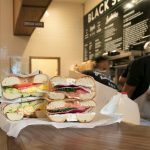 Black Seed balances both, incorporating the bakery into the customer experience and providing the convenience of a limited selection of carefully crafted sandwiches. 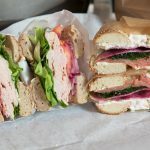 Dianna: The wood fire and the honey (we add honey to the water we boil our bagels in) are unique to the New York bagel scene. 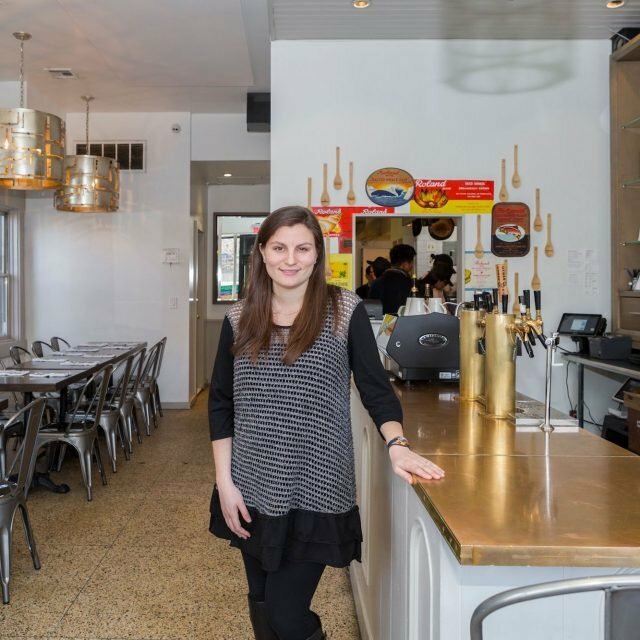 Noah, the shops still get packed on the weekends, but when you first opened in Nolita in 2014, the lines were up to two hours long! Did you expect this? Noah: I don’t think you can predict these kinds of things, simply be thankful and do your best to improve speed and efficiency without sacrificing the end product. 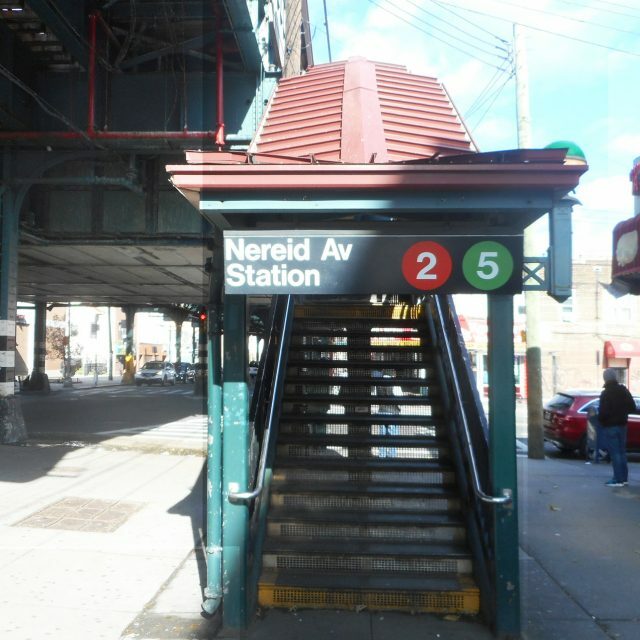 Your third location in the East Village took over the 100+-year-old DeRobertis Pasticeria space. 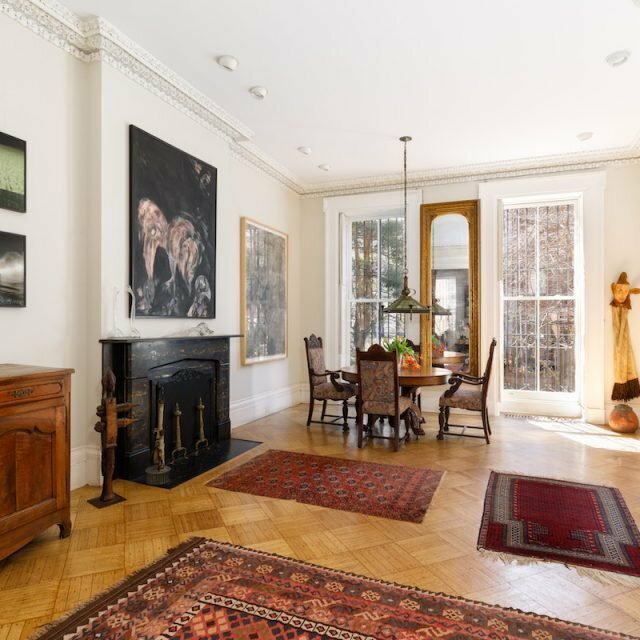 You weren’t required to, but you preserved the historic interiors (tin ceilings, tile floors, etc.). Why was this important to you? 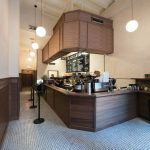 Noah: The space was obviously amazing, a literal relic from a different era of NYC with a heightened craftsmanship, so we felt that it was our duty to preserve not just the use of the space but also its look and feel. 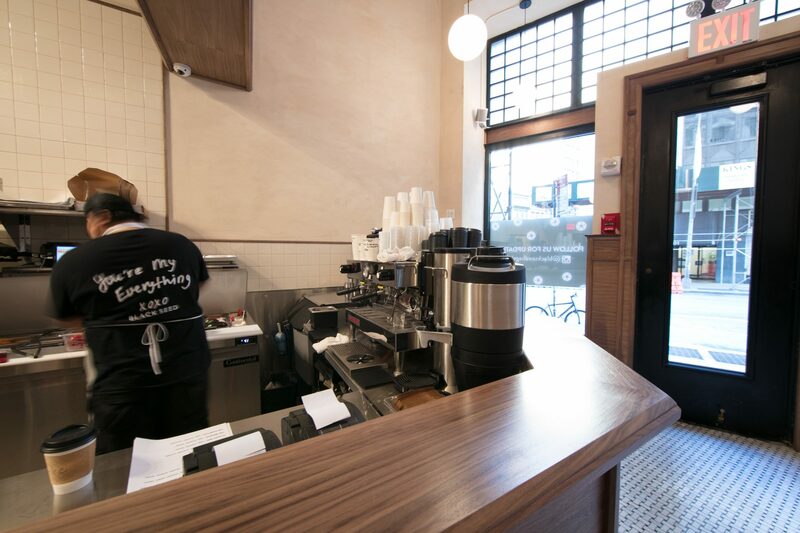 We have different technical needs than a pastry shop, like a 10,000-pound wood-burning oven, so some elements of the space needed to be updated but we’re proud to be a part of this Pasticeria’s history. Why did you pick Nomad for your fourth location? 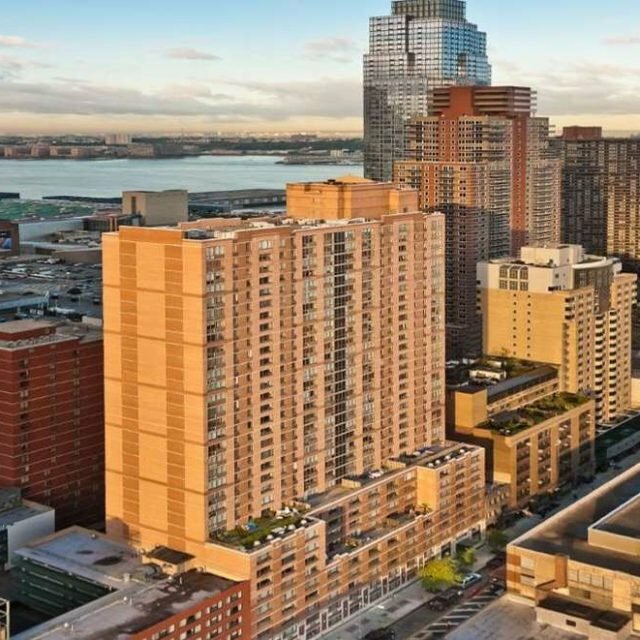 Noah: We have a number of friends in the neighborhood and have been able to watch them succeed, so when this particular opportunity arose, we jumped all over it. 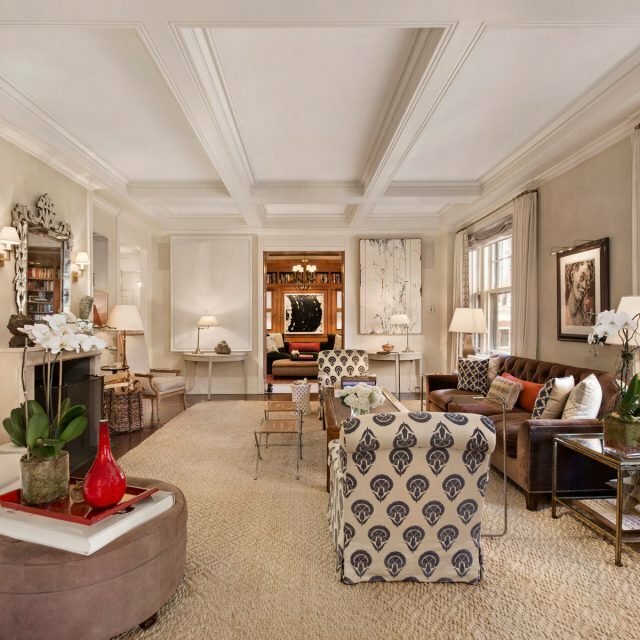 The demographics are very strong, the space itself is beautiful, and we think our service times are particularly well-suited. 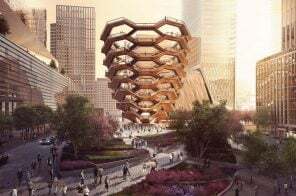 Plus, I can’t help but feel good about opening a spot for bagels and schmear in the historical garment district of New York. 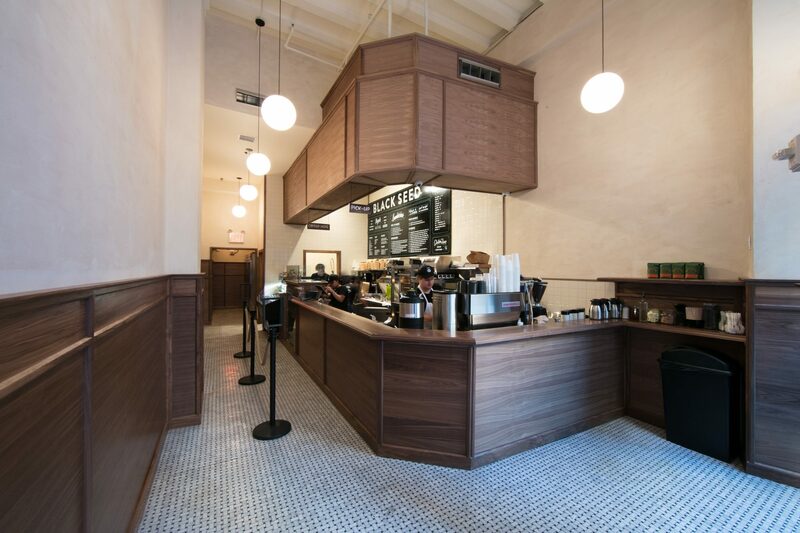 The Ace already is home to cool spots like the John Dory Oyster Bar, Breslin, and Stumptown Coffee. Was being among this company appealing? Noah: Black Seed has worked with Stumptown on our coffee program since our inception, and I personally call many folks there close friends. It’s just a really great product and company and we look forward to supporting each other with our newfound proximity. 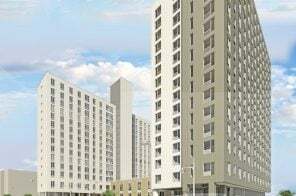 Tell us a bit about the design of the new location. 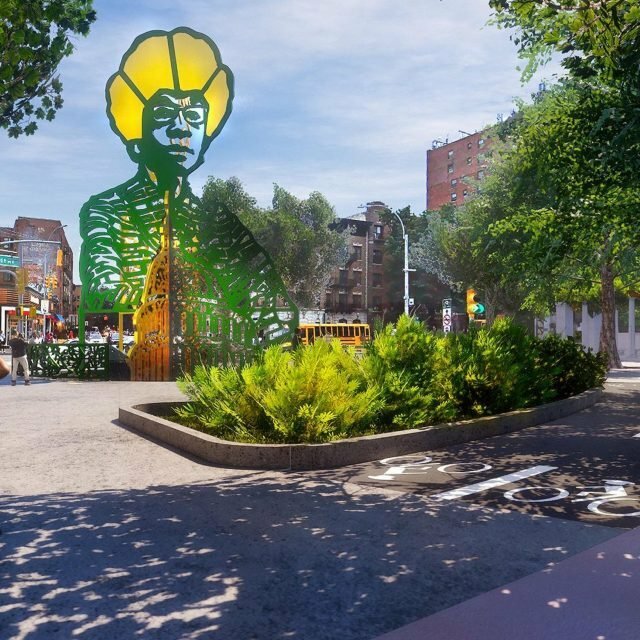 Noah: The new location will have some of the signature design elements of the other Black Seeds but equally defers to the existing architectural features of the space. 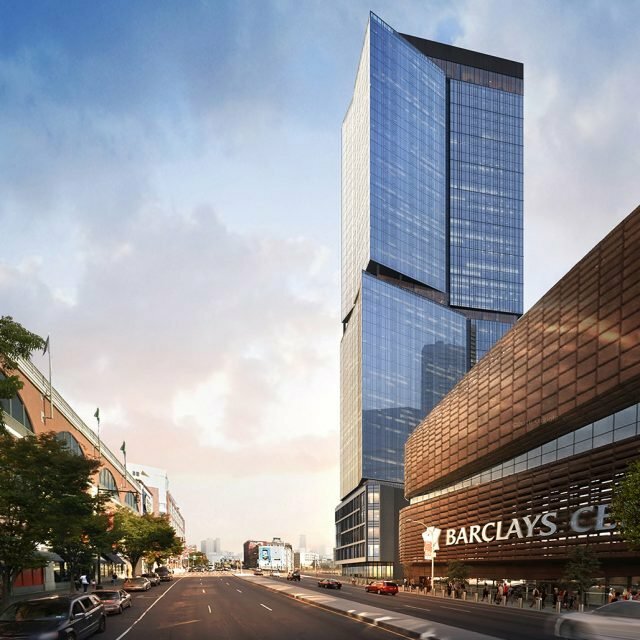 We are connecting the space directly into the hotel so guests can access Black Seed from the interior lobby, which we think will prove convenient in inclement weather. 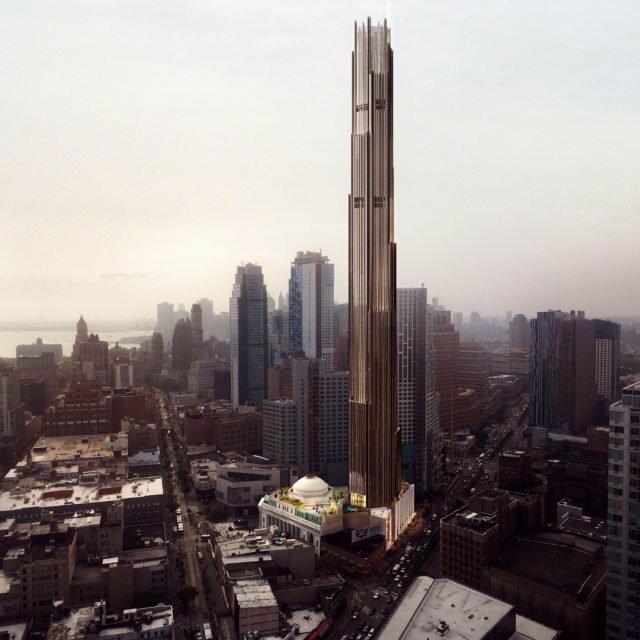 Finally, an overarching focus on efficiency was deployed in the design of the space, which has wonderful ceiling heights but is otherwise not terribly large. Dianna, how did you first get into cooking and eventually make it a career? Dianna: Growing up first-generation Thai/Laotion, my mom felt it was important for me to keep our culture alive through cooking. So, the minute I could wash dishes and pick up a spoon I started cooking. I never felt completely fulfilled in the advertising world. Sitting in front of a computer for long hours and trying to pitch a product I couldn’t afford nor cared much about pushed me over the edge. I needed to do something more hands-on, more creative, and something I actually love doing. What’s the greatest compliment you’ve received about your work at Black Seed? Dianna: Getting nominated for the James Beard Awards for Outstanding Baker. This is a lifetime achievement that I thought I would never ever see or get. 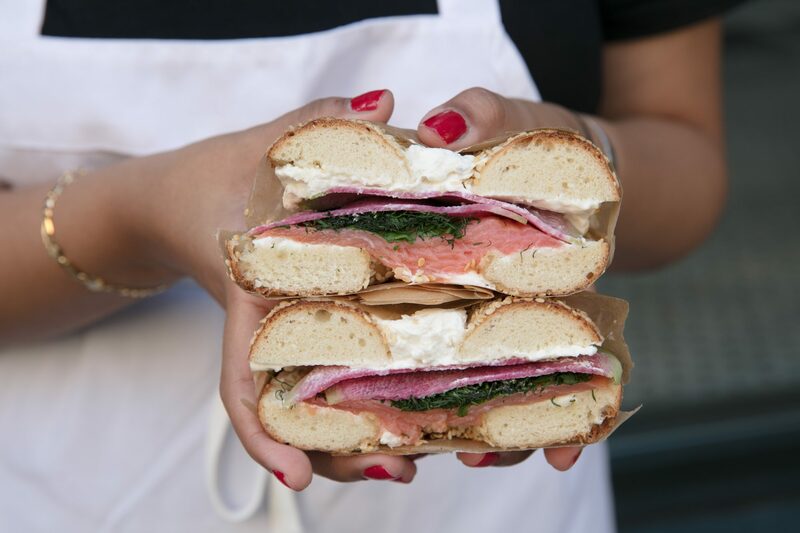 Your bagels frequently make the rounds on Instagram. How do you feel about this and about the Instagram food trend in general? Dianna: I am always flattered when someone posts our food. I personally don’t participate in the “Instagramming of food,” but I understand the trend and its importance in helping small businesses thrive in such a saturated market. 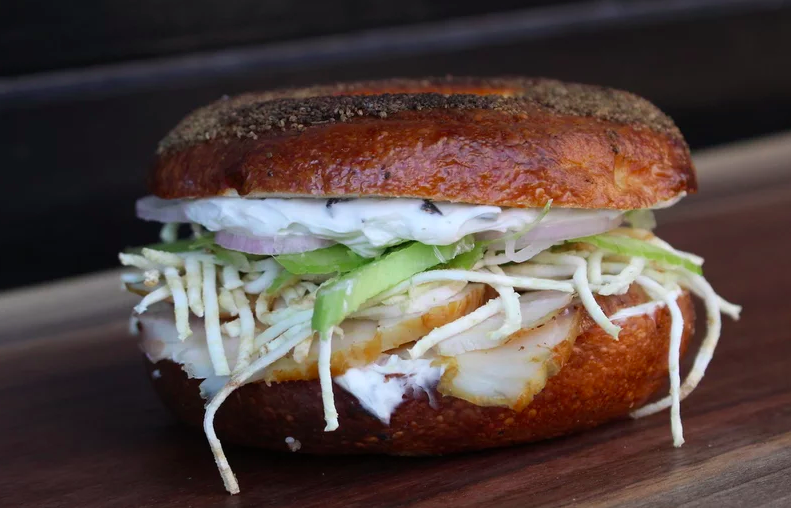 For the new location, Black Seed teamed up with Daniel Humm—chef at the number one restaurant in the world, Eleven Madison Park—on the special “NoMad bagel,” made with a celery seed bagel, smoked sturgeon, pickled celery root, pickled shallots, thinly sliced celery, and black truffle infused cream cheese. Photo by Alex Ostroff. 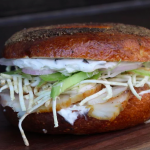 Can you tell us a bit about the Chef Collaboration Bagel Sandwich series? 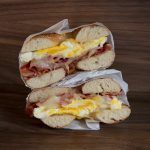 Dianna: For the Chef Collaboration Bagel Sandwich series, we team up with chefs and restaurants we really admire and who have a similar ethos to create a special for the month that reflects them. 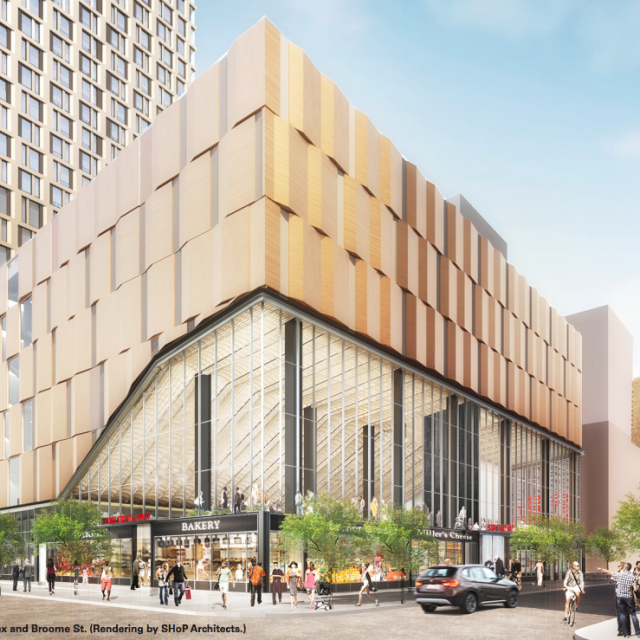 We have had some really interesting ones that have been great hits like the Bao-gel (a Chinese Bao but with bagel dough) and the Eleven Madison Park bagel. 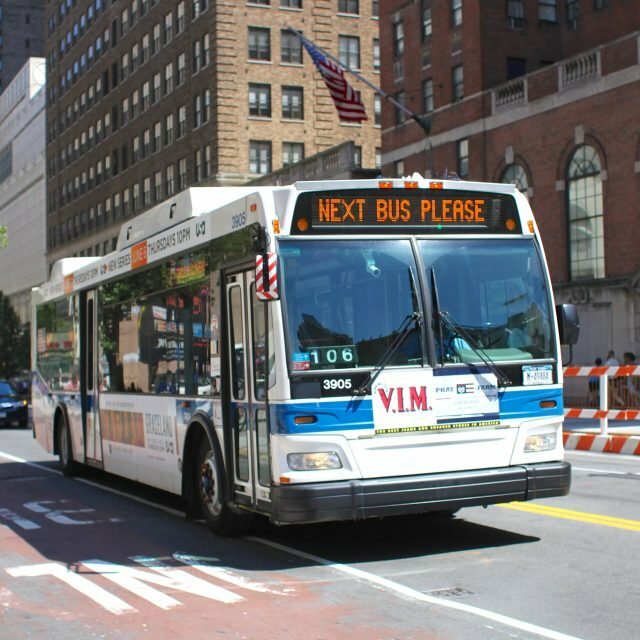 Speaking of others you really admire, what are some of your favorite NYC restaurants and chefs you respect? Dianna: I always love the cheaper “hole in the walls.” Nha Trang is a Vietnamese spot on Walker and Baxter downtown that I love. I also will always have a special spot for Roberta’s in Brooklyn. As far as chefs who I really admire, Dominique Ansel is great because he is always coming up with something cool and classic. Also, Missy Robbins. I got the chance to do a collaboration with her the first year Black Seed opened. I was nervous just meeting her but she was the nicest and most sincere chef! I love the things that Daniela Soto-Innes [of Cosme] is doing. She’s taking something from her ethnicity and making it something new. I always think it is important to respect foods from your past, and make them something all your own, and that is exactly what Daniela does.